This story from Second Samuel is remarkable in many ways. The courage and cleverness of the prophet in confronting the king. The king’s repentance and public confession. Both Nathan and David are justly remembered for this extraordinary moment, when a king met the word of the Lord. But that poor little baby boy. It seems very unfair that the father’s sin results in the child’s suffering and death. I wish he had a name. This story has caused no small problem for theologians. This infant child stands with Job, their stories bearing witness against facile answers to questions of God’s goodness and righteousness. “The Lord has forgiven you, and you won't die. But your newborn son will” (2 Sam 12:14, CEV). The sinner is forgiven and escapes with his life. Yet the innocent child sickens and dies. We may wish that scripture eased our distress, by providing a word of comfort, or at least some more attention to the child. Memorial Day is a special holiday to me. At our house we would raise the flag and fly it for the day. Then at sundown, I'd play taps on my cornet. The sound would roll over the gentle hills and woods of our neighborhood. Then the flag would be lowered. My dad and I would fold it, and it would be taken inside for the next patriotic holiday. Some years we would travel a piece down the road. At a serpentine bend, there was an old farm path with a rusty gate. Follow the path over the hill, past the pasture land and back into deeper woods and gullies, and you'd come to Coldwater Creek, where there was a cemetery. This was back in the late 1960s, when America was coming apart at the seams, as some of our best sons and daughters came back from Vietnam, many thankfully alive, too many damaged, and so many dead. Sometimes when we think we know a story, we can be oblivious to the power concentrated below the surface. The stories themselves might even glance over things which can shake our foundations. Like the story of Paul and Silas. It’s known so clearly and truly as a sign of divine action, bringing God’s people out of captivity. We recognize this story, having heard it with the Hebrew slaves in Egypt, the return from exile, and Jesus’ resurrection from the dead. We long for this story, in the hope that we too may be delivered from persecution, trial, and captivity. In the middle of the night, when Paul and Silas were praying and singing praises to God, “a strong earthquake shook the jail to its foundations. 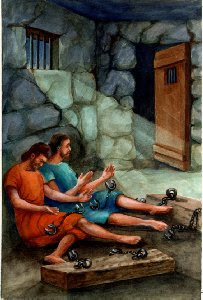 The doors opened, and the chains fell from all the prisoners” (Acts 16:26, CEV). Hallelujah!